Liquid Handling Products Company offers thousands of models of spray nozzles, with a wide range of spray patterns, designs and materials for every need. Typical applications include parts cleaning, food processing, cooling, misting, dust control, phosphating, rinsing, and chemical processes, to name just a few. 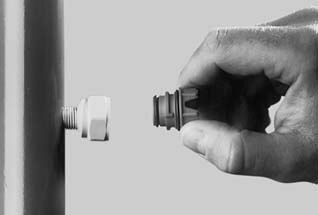 With over 40 years experience in the design and development of spray nozzles and tank mixing eductors. Liquid Handling Products Company is committed to providing new technology and products to suit the ever changing needs of the industrial, municipal and agricultural environments. F-Series spray nozzles produce a flat, fan-shaped spray pattern, with spray angles available from 15° to 110° measured at 40 psi. Spray angles generally increase with pressure, as shown in the capacity table. Suitable for a variety of washing and spraying applications. A wide, flat fan-shaped spray with low impact. The spray is deflected 75° away from the centerline of the pipe connection, as shown. Wherever a low impact, wide angle spray is required. A flat and thin fan-shaped spray with sharp definition on all edges. This spray delivers very high impact over the area covered. The spray is deflected by angle D away from the centerline of the spray nozzle. A hollow cone spray pattern, emerging at right angles to the centerline of the pipe connection. The standard included angle of the spray cone is 70° at 10 p.s.i. At low pressures hollow cone nozzles produce medium size, uniform droplets. At higher pressures finer droplets are produced. SPRAY CHARACTERISTICS: Full cone spray pattern, with uniform distribution throughout the cone. Z-Series plastic spray nozzles come in ZF and ZS styles, and range from 1/8 to 1/2 conection sizes. These nozzles come in Polyproplyene, Natural Kynar and Red Kynar.